The second biggest city in California after Los Angeles, San Diego is a major cultural and economic hub for the state. Sitting right on the border with Mexico and boasting incredible views of the Pacific Ocean, San Diego is a highly popular tourist hotspot, enjoying a warm climate all year long and lots of long, beautiful beaches for people to enjoy. San Diego has a lot of super places for kayakers to test out the waters and admire the beauty of the city and the stunning Pacific Ocean like never before. Bays, lagoons, coves, caves, and more can all be explored when kayaking in San Diego, and here are some details on a few of the city’s best kayaking spots. If you love kayaking, you'll simply adore Mission Bay. Huge open stretches of water welcome countless kayakers each and every year, especially during the summer months, so this is an awesome location to enjoy some kayaking adventures with friends and family. Vacation Isle and Fiesta Island are a couple of super spots to kayak along in this area, with lots of other little landmarks to discover and enjoy. The San Diego Bay, also known as the "Big Bay" is definitely one of to the top spots for kayaking in San Diego. Offering unbeatable views of the city skyline and various monuments, paddling in this marina can be a lot of fun, but it's important to note that boats do use the area, so you'll need a little experience and kayaking technique to challenge these waters and stay safe. La Jolla, which translates as 'The Jewel', is one of the most beautiful locations at San Diego and one of the hottest spots for kayaking in all of California. Sea caves and tunnels can be explored in this gorgeous area, with lots of marine life easily spotted all around as well. Swimming and snorkeling can also be enjoyed at this location. If you want to get out of the city a little for some quieter, calmer kayaking, check out Lake Hodges. Located a short drive northeast of the city, Lake Hodges offers a welcome respite from the busy streets of the city. With over a dozen miles of shoreline to explore and lots of easy access points, as well as beautiful scenery all around, this is a lovely spot for beginners to simply float along and enjoy the day. Multiple kayak tour and rentals companies can be found in and around San Diego. These companies are staffed by kayaking experts who know the city’s waters better than anyone else. They’ll be able to give you the best equipment and top class guidance to enjoy the very best kayaking experiences in San Diego. The top kayaking company in the breathtakingly beautiful area of La Jolla, La Jolla Sea Cave Kayaks runs guided kayaking tours of the stunning waters around this part of San Diego. Taking in the various sea caves, often home to sunbathing seals and sea lions, as well as leopard sharks and countless marine birds, this company offers some of the very best kayaking experiences you can hope to find in California. The only company to provide kayak rentals right down on the San Diego beachfront at any time of day, Just Kayak provides the best priced kayaks in the area. 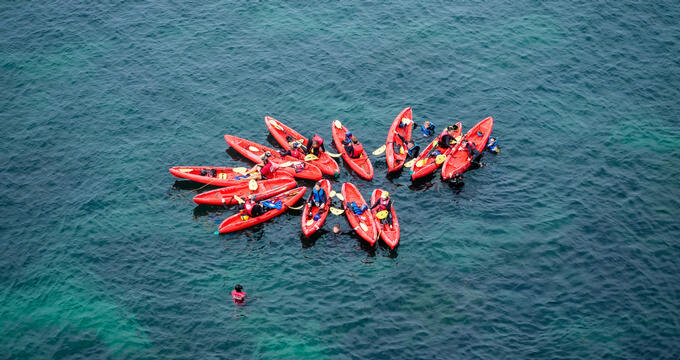 Single kayaks, as well as tandems and triples, can be rented from this location, with all additional equipment also provided. Renting a kayak in San Diego is a great option for people who simply want to head out on the city’s waters and be fully free to explore and paddle at their own pace.